Miami is a city of the future. Leaving its bad old days of the Cocaine Cowboys, nation’s highest murder rate, and crumbling neighborhoods, Miami is earning a place on the international A-list. Multi-million dollar properties abound; the famous and wealthy must see and be seen here; and a full array of cultural venues and arts practitioners make the Magic City the place to be. Miami’s modern day hipness is no accident. Even as construction cranes for highrises became a staple on the skyline, plans for cultural venues and world class events were being hatched early in the Go-Go Eighties. Symphony, dance, film and book festivals were launched and set the stage for more offerings in the future, such as the Adrienne Arsht Center, Art Basel Festival, and the Pérez Art Museum Miami, among others. 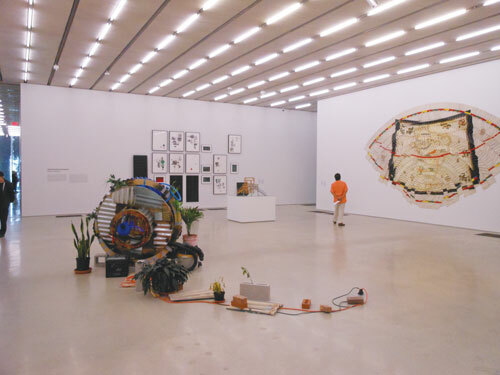 Opened December 2013, today’s Pérez Art Museum Miami (PAMM) began as the Center for the Fine Arts (CFA) in 1983. 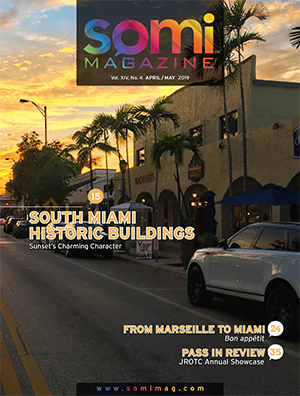 The organization’s museum building shared the Miami Cultural Plaza on Flagler Street with today’s HistoryMiami and the Miami-Dade Public Library. The CFA was born at a time of the traveling blockbuster exhibits. The museum was one which was non-collecting and initially without a permanent collection. Often non-collecting art museums were founded as a way to exhibit modernist works and provide exposure to promote acceptance and understanding of modernism. A museum without a collection is less costly to run because it doesn’t acquire, maintain, conserve, exhibit, and store works of art. The CFA museum was a site for traveling and special exhibitions, programming, and lectures. In 1994, CFA changed its model, becoming a more traditional art museum with an acquisition policy. 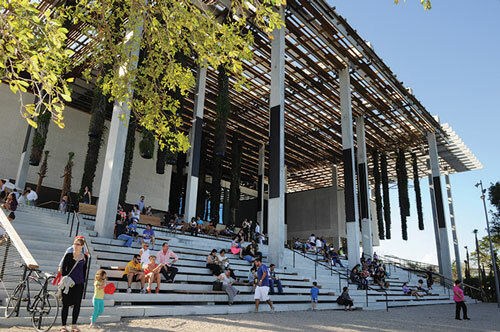 In 1996, the CFA was reborn as the Miami Art Museum (MAM), remaining at the Miami Cultural Plaza. MAM worked to create a new venue that would accommodate 20th and 21st century art. Terence Riley, museum director (2006 – 2013) and the museum trustees shepherded the project to the design phase. They identified three major initiatives for change: first, to be a museum that collected, preserved and presented art; second, to provide education; and third, to become a part of the fabric of the community as a social catalyst. 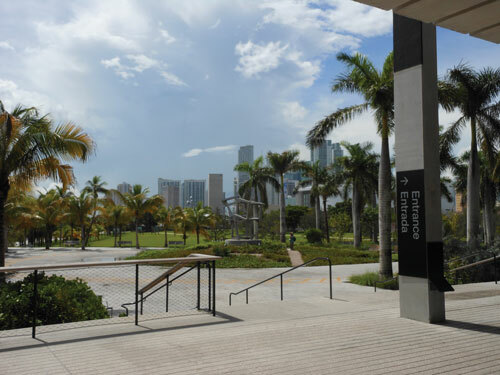 MAM, along with the Miami Museum of Science (re-named the Patricia and Phillip Frost Museum of Science) focused on acreage in the Bicentennial Park to transform it into the Museum Park. The city dedicated the land and funds. Through the Building Better Communities program, Miami-Dade County provided the capital funds for both museums. The renowned Swiss architectural firm of Herzog & de Meuron were selected to design a state-of-the-art, sustainable building to express the museum’s role as an educational and civic forum for the county’s residents and visitors. Thomas Collins became museum director in May 2013 and saw the building’s completion. Collins was also charged with increasing the museum’s art collection. 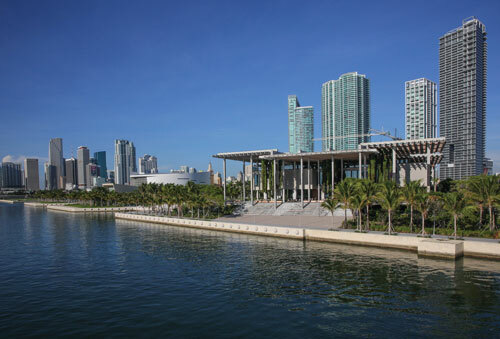 In 2013, the museum moved to the 200,000 square foot facility overlooking Biscayne Bay. The museum was renamed the Jorge M. Pérez Art Museum Miami in recognition of Mr. Pérez’s generous leadership gift. Total construction cost was $131 million. “The building’s environmental circumstances, the hot climate, the heavy storms, have informed the architectural concept in the very first place. The use of concrete and the large canopy are part of a strategy to keep the heat out. Nevertheless, the building appears as a rather fragile structure, and perhaps that is also the beauty of it.” Christine Binswanger, Senior Partner, Herzog & de Meuron. The architectural firm of Herzog & de Meuron was chosen to design a building that would reflect the diversity, vibrancy, and dynamism of Miami and Miami-Dade County. They were strong contenders for the project because of their reputation and according to Terence Riley because, “They had no signature look.” This freed the architects to design a unique structure appropriate to the location and reflective of the South Florida lifestyle. Herzog & de Meuron formed their architectural partnership in Basel, Switzerland, in 1978. The award-winning firm has designed galleries, museums, stadiums, office buildings, and private homes around the world. Among their museum projects in the United States are the Walker Art Center Expansion in Minneapolis (2005); de Young Museum in San Francisco (2005); and the Parrish Art Museum in Water Mill, NY (2012). The highest profile museum project is their conversion of the Bankside power plant to the Tate Modern in London, (2000). They were tapped for the expansion of the Tate gallery and completed the first phase, The Tanks, in 2012. In a gallery is a wooden platform called “My Monument” where visitors are encouraged to send an Instagram photo #mymonument. Atop is Agustin Elizalde from Mexico on his first visit to Miami. 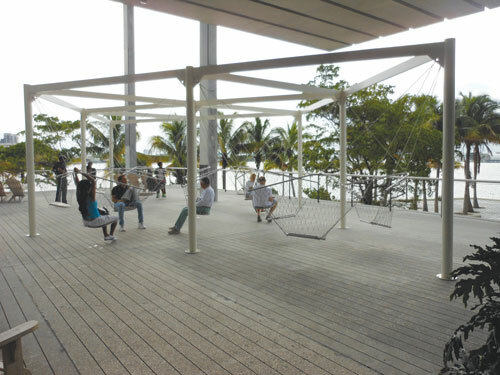 The architects’ design for PAMM takes advantage of Biscayne Bay’s view and breezes and the Florida sunshine. The building’s wooden slatted canopy is reminiscent of the historic homes of Stiltsville located in the bay. The inside-outside design and window placement bring in plenty of natural light; the large canopy that extends beyond the museum walls creates shade and natural gathering areas for visitors. Built on a platform with wide entry stairs, the building creates a flowing open space and a conversation with the natural environment. 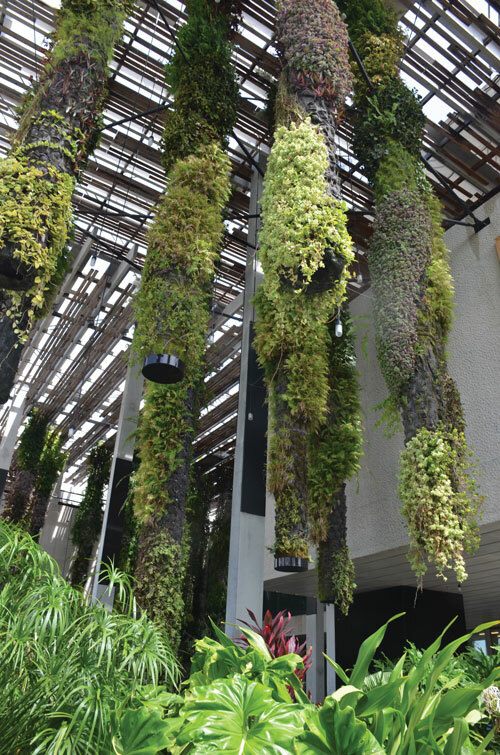 Native tropical plants are suspended from the canopy, softening the hard angles of the building and evoking the region’s lush vegetation. Inside the structure, there is 120,000 square feet of interior space. 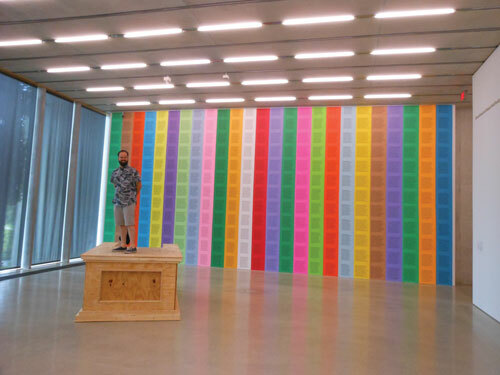 The permanent collection galleries are placed on the first and second levels. Special exhibitions are also located on the second level. There is a mixture of large, flowing exhibition spaces and smaller galleries. Natural and artificial light are balanced throughout the spaces. The lighting, designed by Arup, uses an automated dimming system that adjusts the artificial light according to the amount of daylight coming through the windows. Third floor space is dedicated to educational programming and offices. Entry halls, the auditorium, shop and the Verde waterfront restaurant located on the first floor enhance the visitor experience. Art is displayed throughout the entire building, including the garden and the parking garage. “To balance the intimate and concentrated experience of contemporary art with exposure to the sea and the park was one of the things we wanted achieve,” said Christine Binswanger. Konstantin Grcic, Netscape, an interactive installation of steel hanging swings on the Garden Terrace. The museum’s mission is: Pérez Art Museum Miami exists to improve the quality of life for individual residents of and visitors to Miami-Dade County, as well as social life in the communities they represent, by facilitating catalytic engagements with the most progressive visual arts of our time. It accomplishes this mission via educational programming, community engagement and through its collections and commissioned projects. Further, the museum collection recognizes Miami’s diverse population and its position as a cross-cultural hub. The collection is focused on artists and projects that reflect traditions from the United States, the Caribbean, and Latin America. There is a special interest in the works of local artists and designers. The collections are focused on international art from the 20th and 21st centuries. 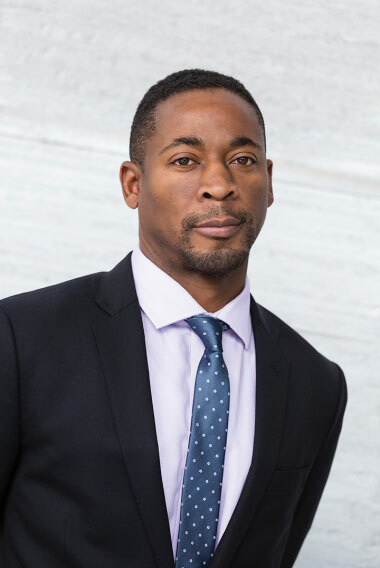 Recently, PAMM announced the arrival of a new museum director, Franklin Sirmans to succeed outgoing director Thomas Collins who went to head the Barnes Collection in March. Mr. Sirmans was most recently the department head and curator of contemporary art at the Los Angeles County Museum of Art. He brings his skills as a fundraiser, honed while working in four major United States markets: Los Angeles, New Orleans, New York, and Houston. He has an impressive background as a curator of contemporary art and was the former US editor of Flash Art and Editor-in-Chief of ArtAsiaPacific. A particular emphasis of Mr. Sirmans’ administration will be as fundraiser for operations and the museum’s endowment. He views the role of curator to be one that has changed to include fundraising, something that has been a part of his professional experience and success. “The idea of being a curator in the 21st century who solely puts together shows, and doesn’t have a part in fund-raising, is not a part of what we do anymore,” said Sirmans. Additionally, he is focused on the museum’s considerable education program, which he says is an integral part of the fabric for museums in the 21st century. 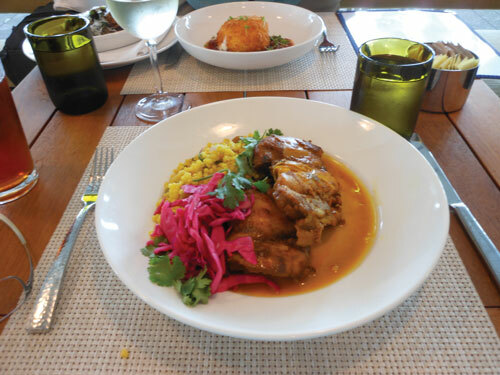 PAMM’s restaurant Verde offers fine cuisine for visitors. Executive Chef Kaytun Brakefield’s Moroccan Spiced Chicken Tagine with Saffron Couscous & reserved Lemon is pictured here. Jorge Pérez is an art collector who lives in Miami. The owner of the highly-successful development company, the Related Group, Mr. Pérez is involved in supporting the growth of Miami. He has a great passion for art, culture, architecture and urban planning. He is an art collector and passionate supporter of the visual arts. 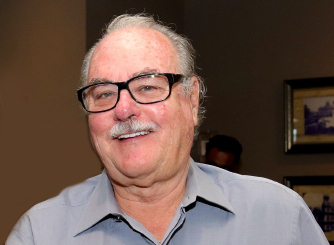 According to PAMM’s website, he has been a museum trustee since 1996, and when the museum announced plans for this new facility, he immediately saw the project as another important step in Miami’s civic development, and was among the first to pledge his financial support. He contributed more than $40 million in cash and art. 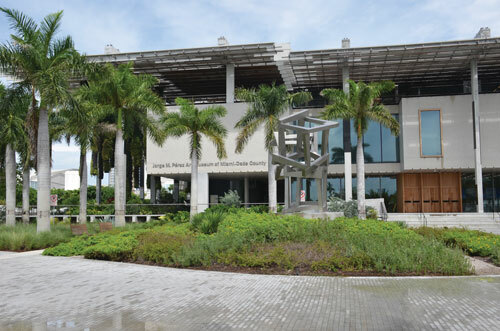 Given both the scale of his commitment, and longevity of his leadership, the museum was named the Jorge M. Pérez Art Museum of Miami Dade County, in his honor. PAMM is a state-of-the-art model for sustainable museum design and progressive programming, featuring a 200,000 square feet of indoor and outdoor program space with flexible galleries; shaded outdoor verandas; a waterfront restaurant and bar; a museum shop; and an education center with a library, media lab and classroom spaces. For more information, please visit www.pamm.org, find PAMM on Facebook (facebook.com/perezartmuseummiami), or follow on Twitter (@pamm) and instagram (@pammpics). 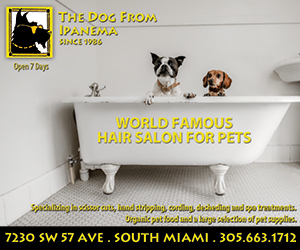 The museum is located at 1103 Biscayne Boulevard, Miami, Florida, 33132. The museum is open every day except Monday and certain holidays. 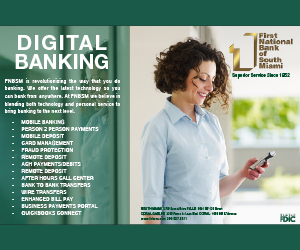 Visitors may contact via phone at 786-345-5662.